My friend the Episcopal priest and professor Father Fred Schmidt posted this illustrated quote from C.S. Lewis on Facebook the other day, and mentioned how fitting it is for mulling on in Lent. Friend Fred also gave Lewis his props for his amazing incisiveness and succinctness in everything he said and wrote. Did he have too much Port when he said this? To the contrary–I’m sure he was stone-cold sober at the time, as he was a very sober-minded Christian in spite of a taste for Port as refined as his Christianity, his thought and his writing. C.S. Lewis remains one of the most influential Christian thinkers of all time, but the man liked his strong drink, a lot, and liked nothing better than holding forth over beer with his Oxford students at his favorite watering hole. Which made him my kind of teacher. Sorry, but I couldn’t resist that cheap joke. A little levity now and again makes the observance of Lent and all that self-denial and self-sacrificial stuff that goes with it a little more, uh, comfortable to deal with. 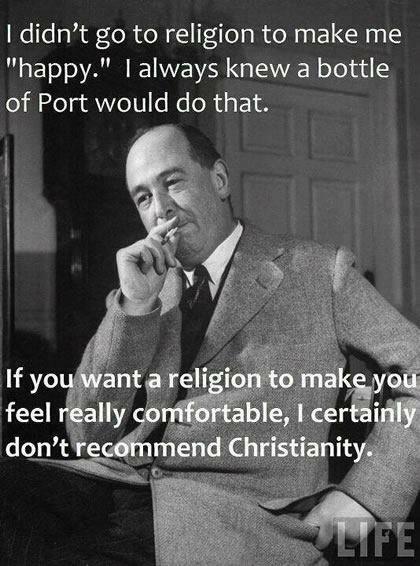 Now one has to wonder if Lewis maybe had wayyyy too much grog when he suggested that Christianity is not about anybody’s comfort. Like any other self-loving, self-respecting Christian, I hold fast to my Christian faith and practices for the comfort and strength and hope and endurance and all that that I get out of it because after all . . .
it’s all about me, about I, me, mine and my salvation and a ticket to heaven, with heaping amounts of Godly leftovers for others in my Christian walk, of course. Being a living sacrifice ain’t always easy, or by any means comfortable, which doesn’t mean, btw, that there’s not joy and self-fulfillment and a sense of well being that feels good to a Christian living much of a Christian life outside the comfort zone. But Lent is a discomforting reminder that being a “living sacrifice” is about a lot about self-denial, self-sacrifice, and even some self-crucifixion that “the world” may look on as “foolish” and a “scandal” (words and concepts that Apostle Paul raised up as well) or even masochistic in some way. But I’ve often said and repeated here recently that Christianity endures because it doesn’t flinch in the face of discomfort or even suffering and death. This is because it recognizes the transformative and redemptive powers of love and love’s ultimate triumph over evil. And we Christians recognize the transformative power of love on the cross, followed by the triumph of love in the resurrection. This is the language we Christians use and it’s a foreign language with foreign meanings that most in “the world” don’t or can’t or won’t ever get. Speaking of me–I didn’t get it for a long time myself. But I’m glad I stuck with the journey to greater understanding. Christianity is nothing if not a sometimes uncomfortable and quite confounding journey. I would argue that His Greatness Mr. Lewis–whose classic A Grief Observed is hard to read–so gut-wrenching is the suffering we can feel him processing in the amazing clarity of his words and message–was plenty sober when he suggested that Christianity is not a religion to be embraced for the comfort it gives to me and my two best friends, Mr. I and Mr. Me. It works so much better with Christianity than journalism. I am reminded of Jesus reaching out to the poor, sick and outcast, while telling the rich that they should give up everything and follow him. It seems to me that if one has a life of ease and comfort, and is not at least a little troubled by the problems of the world, then one is probably not getting the whole point of Christ’s message. The point sure seems to get missed on an awful lot of people doesn’t it.